Fabian's remarkable 25-year career of providing strong direction and infrastructure building in the field of behavioral health is highlighted by a personal dedication to maximizing program efficiencies and empowering others to succeed. 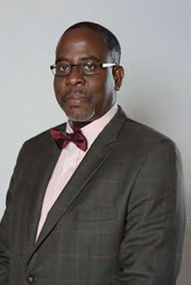 He currently serves as vice president of Behavioral Health Services for the Jessie Trice Community Health Center, Inc (JTCHC), a forty-plus year old federally qualified community health center. Fabian championed his team of behavioral health experts through numerous Joint Commission re-accreditation cycles. His natural problem solving ability has proven invaluable as he provides executive oversight for several diverse Federal, State, Locally funded substance abuse/mental health and community health promotions programs. Leading with conviction, Fabian truly exemplifies the "big picture" thinker, always having the foresight to see the long-term implications of a plan. He has a steadfast commitment to finding innovative ways to create opportunities for the less fortunate in his community. He and a team of seasoned healthcare industry experts orchestrated and implemented a highly successful discount medical card program and a one-of-a-kind inner city health & wellness center. Displaying a wide range of skill sets, he also provides leadership for JTCHC's corporate communications department, which includes responsibility for media relations, advertising, branding, and internal and external communications. Fabian is deeply committed to public services and sits on the board of Informed Families, a non-profit agency totally committed to helping kids grow up safe, healthy and drug-free. He has made important contributions to a myriad of community organizations as a testament to his drive and passion for effecting global positive change. Fabian graduated from St Leo University with a Bachelor of Arts in psychology and completed graduate/doctoral studies in clinical psychology at Carlos Albizu University and California Coast University. He is married and the proud father of three daughters.